When I saw “graffiti” in the title of the email, I imagined spray-painted epithets, possibly the work of ne’er-do-wells with an axe to grind against the Amish. By the looks of things, the etchings in these photos from contributor ShipshewanaIndiana appear to be the work of young boys, perhaps killing time after a church service. 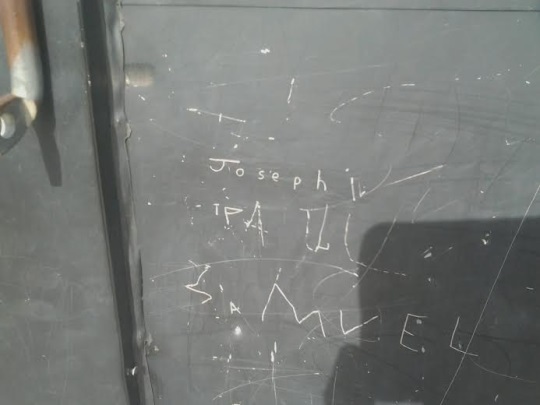 I can’t quite make everything out in the images–in the first one we clearly have a “Joseph” and a “Samuel”, but not sure who’s/what’s in the middle. In the second photo, I can’t tell what’s on top, but looks like a baseball/softball player did the one on the bottom. 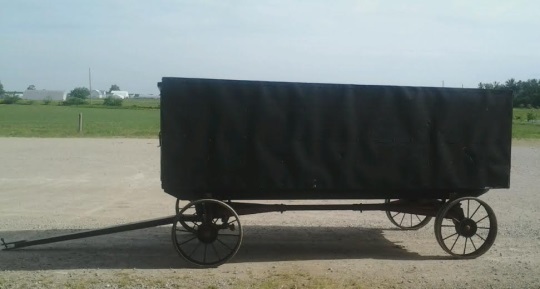 Just a little slice of life from the Amish community of Adams County, Indiana. Could it be the name Paul? Now that I look again I think “Paul” could be it…there is what looks to be an “I” right before the P that threw me off. Maybe that was just the first attempt at etching a P.
Had some of the same problem, Erik. It’s a bit hard to tell the intentional from the extraneous markings. In the lower pic could the top word be “Notice” (although I have to admit that making an ‘o’ out of the second letter is a bit of a stretch)? Slightly-Handled-Order-Man, my aunt and uncle had a wall full of the kids “graffiti” in the little closet where the hot water heater and stuff was. They put a pencil sharpener on the wall in there and after someone wrote something, messages were written back and forth for years. I wonder if the people who live there now got rid of all the stuff we wrote. are a ball team in the settlement, I wouldn’t think it would be too hard for the ministry of the district to find out who wrote the graffiti. What I noticed was that this graffiti is so much “milder” than what we see written on buildings, walls, sidewalks, etc. in urban areas. I guess I’m letting my own experience give me tunnel vision. I had just assumed that Fairview was a ref. to some Amish school (e.g., www.flickr.com/photos/ozarkinspirations/4788586871/in/set-72157624358198321), and Fairview Sluggers was just an informal nickname assumed by the kids that play ball there. 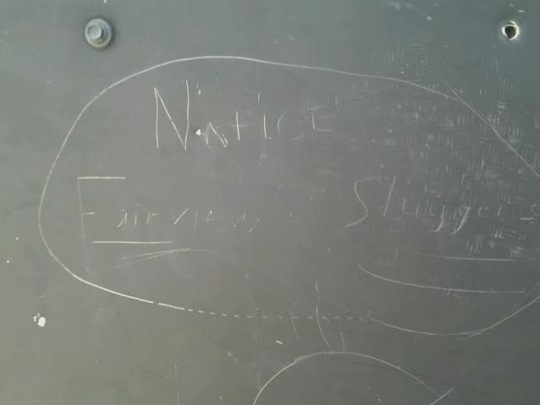 If that is the case, I would be curious to know if the Fairview school was within this church district (with kids from Fairview writing on their own buggy), or if it were some kind of “cross-town revelry.” But I could be way off on all that. Don, there does seem to be a Fairview Amish School in Adams County. I think it is Paul that is in the middle of Joseph & Samuel. “Amish Graffiti”…sounds like another bad cable TV show about the Amish!